The Nyumbani Village, Kitui, is a project sponsored by the Children of God Relief Institute, with assistance from donors and other well-wishers. The main aim of the Village is to provide a home for 100 families that will comprise 1,000 children and 100 of their elderly grandparents. For a child to live at the Village, they must be a double orphan (both parents are dead), destitute, and with no extended family support available. For the grandparents it is the same, destitute and with nobody able to support them. Instead of placing these children in an institutional setting, Nyumbani Village tries to recreate, as much as possible, a traditional family life for these children. To that end, each grandparent lives in their own house with 10 children, of both genders and of varying ages. In the homes, the children and grandparents prepare their own meals, do their own chores, grow some of their own food – as most any other family in the area would. There is a basic medical clinic, playing fields, a small shop, and a large farm. 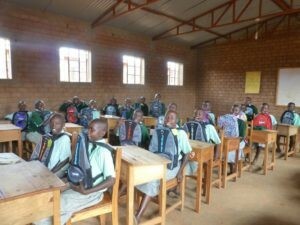 They attend primary and secondary school in the Village, or train in a practical skill at the polytechnic. This is a model aimed at addressing the ever-growing problem of orphans in Africa and is expected to become self-sustaining in a few years. Located in a semi arid area of unfavourable climate with less than 700mm of rainfall annually, little or no industrial activity, high prevalence of HIV/AIDS and very poor economic prospects, the Village faces the challenge of ensuring that all the orphans under its care turn the tide of poverty and become self-reliant members of society at the time of leaving the Village. HIV/AIDS pandemic has continued affecting Africa causing many deaths among the middle aged; many children have been orphaned forcing them to either become heads of homesteads or depend on their elderly grandparents who are also destitute following the death of their wage earning children. This situation is very desperate because such children lack all the basic necessities including education, parental love and care which has resulted in them becoming street children or criminals for lack of guidance. Nyumbani Village is seeking to address this problem by bringing these two vulnerable groups together in a model village where they can assist each other bridge the gap. Our main object is to provide quality skill training to the orphans at Nyumbani Village so as to enable them compete at the job market with other children who are fortunate to have parents. With skill training these children will be able to venture into business enterprise and become self-reliant hence turn the tide of poverty. We will also extend the same service to the surrounding community who are also very poor. Nyumbani Village has now admitted 894 orphans and 91 grandparents. We have built a primary school, secondary school and the polytechnic within the compound. Once children have finished their primary education they have the choice of joining either Secondary School or the Polytechnic. Those admitted at the Nyumbani Village Polytechnic follow a more skills-based curriculum. June 2015 - 1800 to support 12 students in the Poly Tech. Would you like to volunteer in Kenya? Volunteers required to travel to Kenya to work in a self sustaining village in Kitui. 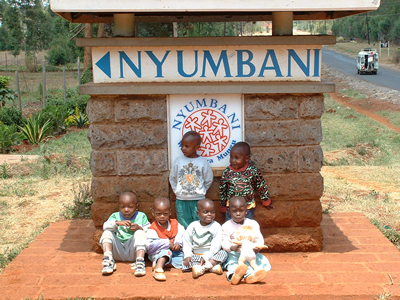 http://www.nyumbani.org. 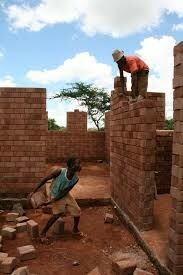 Duties include building,farming,harvesting and working with the village children. Volunteers with Medical /Nursing experience also required to look after medical needs of volunteers.Clinic on site.